What are Activated Nuts and what are their health benefits? What are activated nuts? And what are their health benefits? Nuts are known to be healthy for being a good source of essential fats, minerals, protein and antioxidants. Especially for vegans, vegetarians and people who eat less meat, nuts are a substantial part of their diet. But do they have any downsides? They may make us feel full, heavy and can be rough on our digestion. If you want to enjoy nuts in bigger quantities, and still have a good gut feeling, we recommend activated nuts. Why does Nutmad activate nuts? Nuts and seeds contain natural chemicals, called phytic acid and enzyme inhibitors. The enzyme inhibitors are good for the nuts, because they prevent them from prematurely sprouting. But they are not so for us, because they have the ability to clog the metabolic enzymes in our body, which play an important role when it comes to processing the food we eat. This makes nuts hard to digest. Phytic acid can bind to minerals, such as iron, zinc, manganese and, to a lesser extent calcium, and slow or prevent their absorption. This makes the minerals and their beneficial qualities less available to the body. Soaking nuts in water neutralizes the natural chemicals, the amount of starch and fibre reduces, and the protein and vitamin content increases. Nuts become easier to digest and more nutritious than non-activated ones. How do we activate nuts? Different nuts need different time to soak. At Nutmad we soak almonds at least 12 hours. We add some sea salt to the water; it helps to activate the enzymes that break down and neutralize the enzyme inhibitors. For our plain activated almonds, we don’t use any additional seasoning but they may still taste slightly salty, which is due to the bryne. 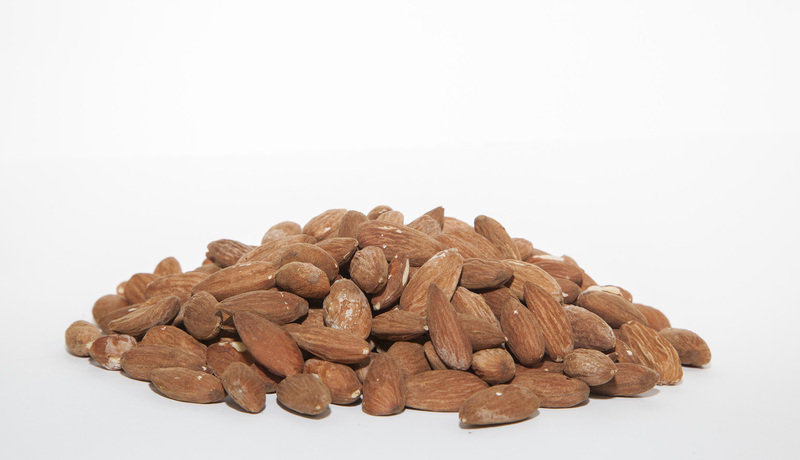 The other kind of almonds we offer in our online shop, are lightly seasoned with sea salt. After rinsing and seasoning we dry the nuts in the dehydrator. To preserve the nutrients and to get the best taste, nuts are being dehydrated at a low temperature, not over 70°C. 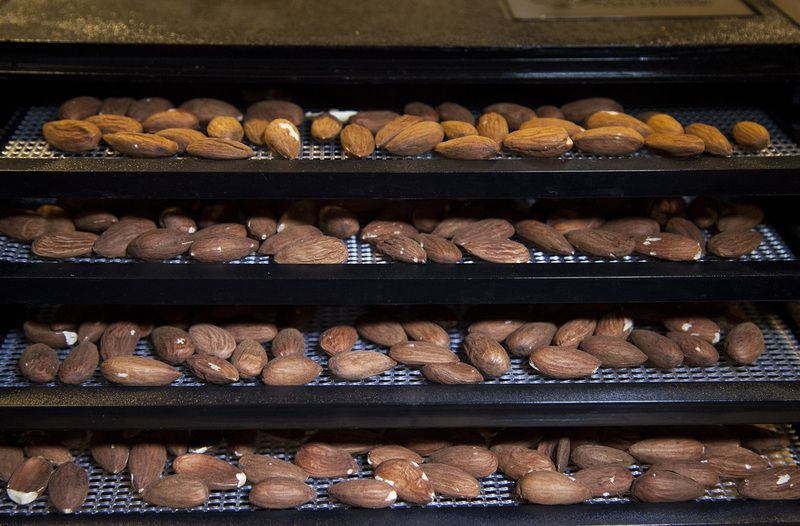 To become really dry and crispy, almonds need over 24 hours of dehydrating. The wait is worth though; once they’re ready, they taste delicious! Activated walnuts and cashew nuts which will be our next products, need less time for soaking – eight hours for walnuts and two to four hours for cashews. They are dry and ready to snack after 12-18 hours. When you eat activated nuts, you may notice that you don’t feel as full and heavy as after eating them raw, since they are gentler on your digestive system. Being a great source of protein, nuts and seeds are an important part of vegan and vegetarian diets. In this case activated nuts can be particularly beneficial, since they are consumed in larger quantities and on a regular basis. If you are anything like us – not vegan, not vegetarian, just mad about nuts – you may find yourself snacking on nuts any time of the day. Activated nuts make you feel good even if you get carried away. Eating protein rich food is very important for pregnant women. Especially if they are pregnant with twins like I was. A handful of soaked almonds daily can help reduce allergies in babies; macadamia is rich in folate, which is essential during pregnancy; walnuts can help boost the baby’s brain functions like learning abilities and memory. Breastfeeding mothers need a lot of nutrients like Vitamin E, Vitamin B2, B3, and B1. It is also a rich source of minerals like Magnesium, Copper, Phosphorus, Calcium, Iron, and Zinc that can be found in almonds. To get as much as possible from those nutrients, we recommend activated nuts. Different kind of nuts have different nutritional qualities. Some contain more calcium, others more vitamin E. If you want to know which are the best nuts to boost your diet, have a look here. I hope it was worth the wait. 🙂 What kind of nuts do you prefer?